This is a great salad for summer when there are tons of watermelons at the farmer's markets. This is a good introduction into some more grown up tastes using a familiar summertime fruit. You can use blueberries or blackberries in this salad depending on what is available. My kids are REALLY into goat cheese recently, so they have enjoyed this salad a lot. I would go a little easy on the dressing at first, as it may be too unexpected for some kids at first. The Tiny Tasters were not crazy about this, but as you can see there were no big "Yucks" either. I consider this a victory considering this has some more sophisticated flavors and combinations. 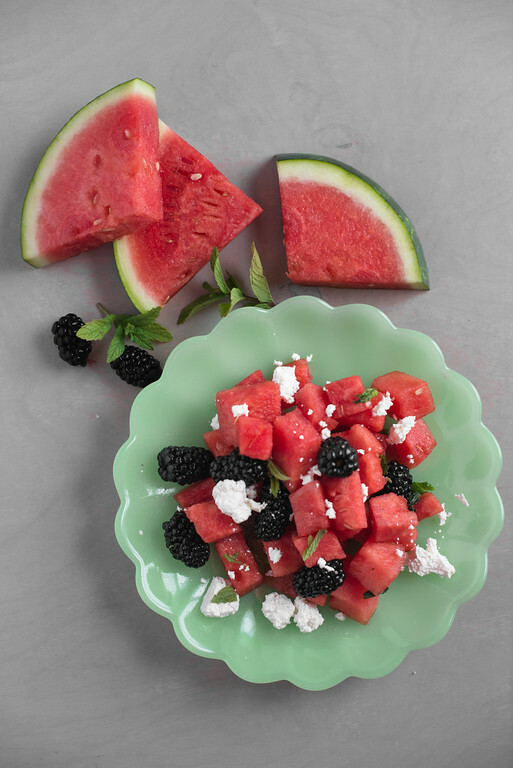 Toss watermelon, berries and mint together in a large bowl. Whisk olive oil and vinegar together in a small bowl and splash over the salad, tossing lightly. Add goat cheese and toss again. Sprinkle with salt to taste. This recipe has goat cheese and is therefore tagged as having milk. Many people with dairy allergy can not tolerate goat’s milk either. Talk to your doctor about goat milk products if you have concerns about dairy.